Whenever I have asked anyone from the Manhattan Beach, CA area about burgers, the name Ercolés has always come up pretty quickly. Happy Meal was on a play date on this particular Saturday afternoon, and that meant that I could finally try a burger at the 21 and over only establishment. Metered parking was convenient and close by. Seating was ample inside the small, dim space. Ercolés had been established in 1927, and it looked like very little had changed since opening day aside from the addition of a bunch of flat screen TVs on the wall, which were showing various football games. Ercolés only served the burgers between certain hours during the day and on select evenings, so call ahead. When I walked in, I was impressed at the sheer size of the patties already sizzling on the tiny gas grill. The protocol at Ercolés was to order at the bar, pay (cash only), find a seat, and wait for your burger to show up. My cheeseburger arrived in about 10 minutes. The Beef: The burger meat at Ercolés came from Manhattan Meats, which was located next door.....seriously, it was the actual next door to the North. I popped in to speak with the staff at Manhattan Meats. They informed me that the Ercolés burgers were Chuck with a 15% fat content. The beef was delivered (walked next door) pre-ground and formed into thick, 8-9 ounce patties. The grind was medium-fine. The burger patty was quite good. It was pornographically juicy. 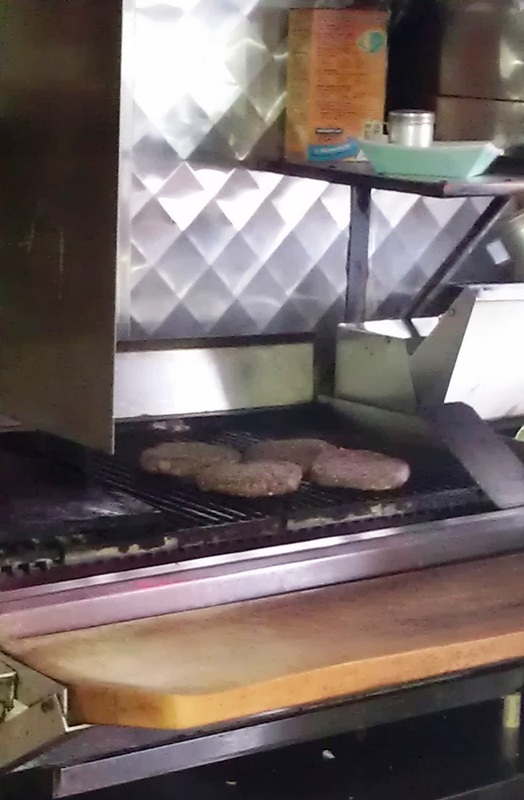 It was strongly beefy, and a firm note of iron was imparted from the ancient cooking grate upon which the burgers were grilled. The patties were loosely formed, and this created a pleasant and yielding mouth feel. The Seasoning: A salty seasoning blend was liberally applied to the burger patties as they cooked. The seasoning was spot on, and the salt enhanced the beefy flavor of the thick patty without masking any of the flavors. The Sear: The sear on my burger was nominal. The grill could have been 20 degrees hotter. The patty picked up some good color, but it was lacking in crunch. That was the trade off from the low fat and high moisture content. It was worth it, because the burger at Ercolés was fantastically juicy. The Preparation: I ordered Medium, and a Medium burger was what showed up. My burger had deep indentations on the surface, which indicated that it might have been pressed on the grill, but it was so juicy that even if they leaned on it, it was still good. The Cheese: The cheeseburgers at Ercolés came with a single slice of nicely melted American cheese. 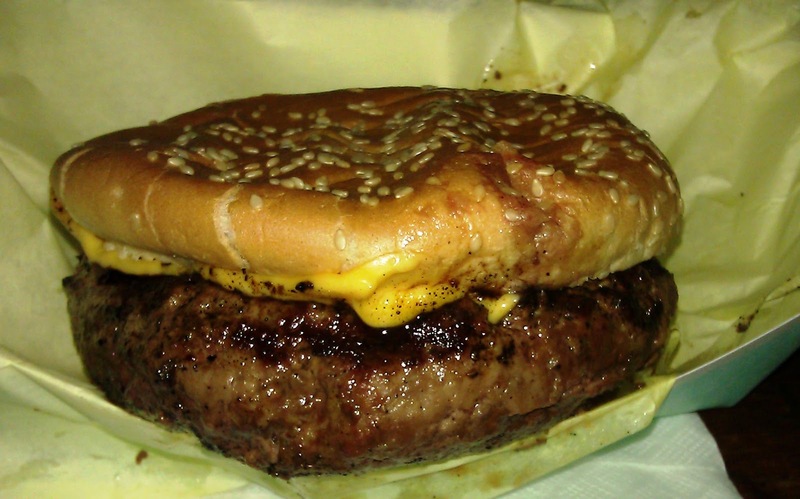 On any future visits, I intend on ordering my cheeseburger with two slices. The cheese was nearly lost in the massive beef patty. I am not faulting Ercolés for delivering a great burger value. The bites where the cheese came through were splendid. The Bun: The standard, seeded, burger buns were moist fresh, and perfectly generic. The un-toasted bun just barely contained the juices from my burger. The bun was invisible in the bite, but it did manage to keep my fingers dry. The interior of the bun was saturated by the third bite. The Meat To Bun Ratio: This was one of those rare cases where the meat DOMINATED the bread. The Fries: There were no fries. The Toppings: The massive dill pickle spear was crunchy, and it had a refreshing clove flavor. The thick tomato slices were ripe, juicy, and very flavorful. They must have provided 1/4 pound of fresh Iceberg lettuce, too. The veg at Ercolés was surprisingly good, and there was a ton of it. The Value: The value was spectacular for an Ercolés cheeseburger. It was a mere $6.25 for a 9-ounce, juicy monster with delicious, fresh veg. As I was departing Ercolés, I noted that the guy from the butcher shop next door was sitting in a booth waiting for a burger. I think that said it all. 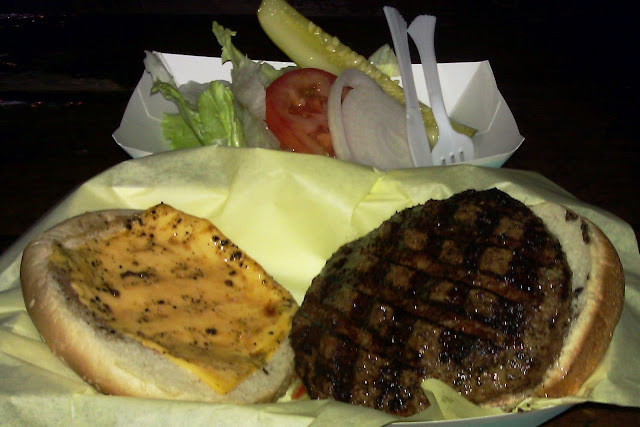 Burger Review : A darn good and amazingly juicy burger for an excellent price. posted in 2011 with no comments? all i would argue is the burgers at ercoles deserve 5 bite score.